On a Wednesday morning, a wall serving as a screen in a darkened room at Gallery Espace comes alive with red and pink hues painted on a piece of slowly melting ice. The camera remains fixed in this position for the next 11 minutes and once the eyes and mind get accustomed to what is going on, one can detect tiny rivulets formed by the melting ice. Gradually, the colours on screen become yellow and brown. Avant garde-ish music accompanies the unfolding event (which feels more like a non-event). We know that the work, titled Meltdown 1–Red Raga, is artist Nitin Mukul’s take on climate change and environmental degradation because the accompanying handout and opening credits tell us so. The next piece of artwork, A Short Passage of Fire by Rajan Krishnan, shows books being consumed by fire over 13 long minutes. This is followed by T.K. Hareendran’s River, in which we see the artist first immersing little clay models of fish, tortoise and birds in the Yamuna, then taking them to Uzbekistan and displaying them there, before immersing them again, this time in the river Syr Darya. If all this leaves you befuddled, you are obviously not familiar with video art. The works are being shown as part of the gallery’s Video Wednesdays—a monthly screening of video works selected by Johny M.L., the show’s curator. Over the past few years, a growing band of artists have been generating a steady output of video artworks. They are being aided and encouraged by galleries in India and abroad, as well as by a very small but growing number of Indian collectors who are fascinated by the medium and are not afraid to try something new. The first works of video art were created in the West in the 1960s, and Indian artists began experimenting with the medium in the late 1990s. The art form can be best defined by what it is not—it is not cinema. “The difference is not in technique or technology," explains artist Vishal Dar, who has a master’s in fine arts in digital and new media art from the University of California, Los Angeles. “It is in structure and sensibility." It is shot like a film, using any camera—it could be a VHS video camera or the updated digital versions or even a mobile phone camera—but, more often than not, the similarity ends there. The aesthetics of the format depend to a large degree on playing with, and upending, the rules of film-making. “Video art’s USP is blurring the lines between film, short films, documentary, home video, mobile cameras, surveillance shots," says Johny. However, it is cinema that has inspired many artists to take up this art form. Among them is Ranbir Kaleka, one of the foremost names in the field. As he puts it, cinematic images “are made of light and they have a certain quality that is very different from the painted image. Painting has a physical weight, a ‘thingness’ about it." Trained as a painter, he first came across video art as a student in England in the mid-1980s. Kaleka sees his video works as an amalgam. “The image I get is neither of painting nor of cinema. I want to see what happens when the two are jelled together," he says. Man With Cockerel II, a 6-minute videowork by him, illustrates his point. It is like a painting that is also a motion picture—parts of the image, such as the branches of a tree, remain still, while parts of it, such as a man who wades into water with a cockerel in his hand, are dynamic. The cockerel escapes from his hands to fly out of the screen. Some more things happen and then there is the stillness of a painting, again. Buyers of video art in India are few but growing in number. 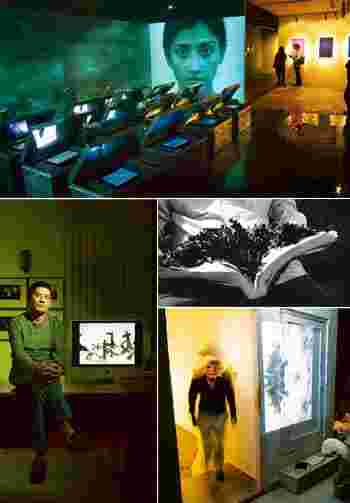 New media art, which includes video art, received a big endorsement when Anupam Poddar, a pioneer collector, opened the Devi Art Foundation in Gurgaon in September—a space dedicated to showing new media art. Poddar showcased many works from his personal collection at the Foundation’s inaugural show, Still Moving Image. He points out that buyers such as himself are the exception. “People haven’t warmed up to the idea of video art," he said in an email. Fashion designer and proprietor of Palette Art Gallery in New Delhi, Rohit Gandhi is more upbeat. “You see, photography and installation art was the first stage," he says. “People started buying it. Now it is the turn of video art." He feels that video art is a good buy provided one has the space—at home or in a commercial arena—to show it. Gandhi has already bought four video works and plans to install them at his factory. They have cost him Rs1 lakh on average, a good price, he says, given the time and effort it takes to create them. “I definitely think the individual collector can buy it," says Poddar. “If you think about conservation issues or even display issues, a video work fares much better than a painting or a sculpture. The immateriality, portability and easy storage are some of the factors that work in favour of video art." Delhi-based collector Swapan Seth would agree. Since he began buying a couple of months ago, he has collected about 20 video artworks, which he shows in his private gallery or on portable DVD players. “In the world of art, it is important to predict the future and not just enter it," he said in an email. “It is important for collectors to embrace and encourage newer technologies… There is a vast body of youngsters who have made video art their calling. They need to be encouraged." Artists who make video art also sound optimistic about its future and their own ability to pursue it—both of which depend on patronage and collectors willing to buy their works. According to Bangalore-based video artist Surekha, collectors have started buying video art in the last two years. She points out that the screening of video works at museums abroad is another source of income. On average artists are paid anywhere between €250 (around Rs15,000) and €500 for screening their works. Surekha—who has been a full-time artist for the past 12 years and whose first video piece was shown abroad in 2001—says that initially, making video works was cheaper than showing them, since most galleries were reluctant to exhibit them. Now she gets three or four foreign shows in a year and says that being an artist is working out for her financially. An established artist such as Kaleka recalls selling the first edition of a recent work for $25,000 and its second edition for $30,000. Gigi Scaria, a Delhi-based artist, has made 20 video works in the last six years. So far, he has managed to sell only one—all five editions of his 2007 work titled Panic City were bought by people for their private collections—but he says the money he spent making them has been worth it because of the appreciation he has received. “It is not just meant for museums or for private viewing," Scaria says. “You can watch it sitting or standing and you don’t necessarily need a quiet ambience for it." Johny concurs. “It’s a democratic medium," he says. “You don’t need a gallery. With YouTube and blog, etc. you can disseminate it to the world."